Discussion and requests for new features. Please note that FlightGear developers are volunteers and may or may not be able to consider these requests. 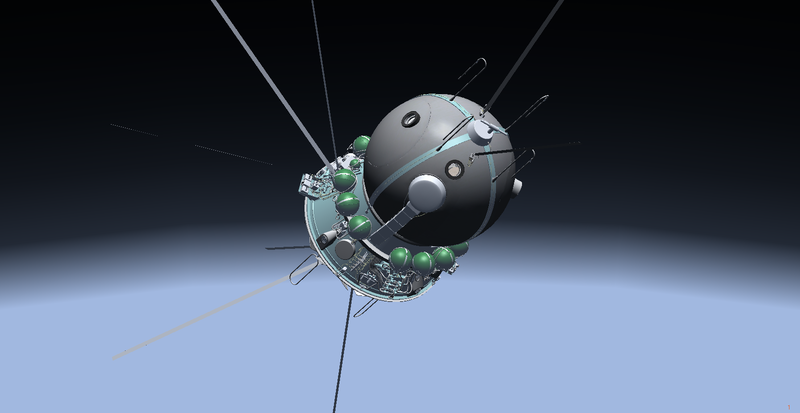 Update: "Vostok-1" project is frozen due to absence of interest of other developers and users. On current terrain engine it hangs too often and on flight altitude shows not Earth but blue fog. Will like to continue project but only after will get some help on means of terrain engine improvement. Please write to me if You'll decide to help. something and produces great lags. but does it one time in minutes. I suppose what including some other terrain engine, say osgEarth http://osgearth.org/ and switching on it from some speed/altitude could solve all that problems. But me myself do not competent enough to implement it. I could do something in that case still but need a lot of help. It would be better if someone else would do it because I have a lot of problems to solve in "Vostok" and have a plans for next projects already. Last edited by vitos on Wed Jun 01, 2011 8:07 am, edited 2 times in total. Waste of time: too unprofitable for work, too exhausting for hobby. ...so you're saying that you are trying to implement an alternative terrain generating engine that pre-loads all scenery tiles beforehand? If that's so, wouldn't it still cause lag, since FG would have to account for every one of those drawn terrain tiles? Look for "B-BIRD" "N127KY" or "AVA0004" -that's me. I think what he suggests is that once you go over a certain altitude, say 80,000 feet, a different terrain engine takes over and displays a different set of tiles that are scaled to show entire continents and oceans. it would be a wonderful feature if it were possible. Or, instead of alternate tiles, maybe a model of the entire Earth? Sealbhach wrote in Fri May 13, 2011 2:20 am: I think what he suggests is that once you go over a certain altitude, say 80,000 feet, a different terrain engine takes over and displays a different set of tiles that are scaled to show entire continents and oceans. it would be a wonderful feature if it were possible. I think it's possible of course, simply need someone to make it real. kyokoyama wrote in Fri May 13, 2011 2:29 am: Or, instead of alternate tiles, maybe a model of the entire Earth? It, as I can understand, uses image tiles and some alpha images to implement ground elevation. This gotta be faster then current FG weighted engine on any altitudes, especially on high. Theres's no need to check ground collision or make it very detailed when craft is 50km above the Earth, so I think it would not make great lag on start or run. It can use tiles with different resolution to show, say, launchpad, better then other terrain, and so on. And because it osg based already there would be not so much work on including it. Only question is how to switch off current engine on the run and start that new other engine. That option could be switchable, then normal users would not be affected by it at all. Maybe it would be even better to include it instead, that could open ways to implement Apollo and similar projects in Flight Gear which of me personally interested in much. I would do that myself but I am personally not so deep in that stuff. So I need at least some explanations about how it implemented in current FG code and possibly some help on attempts to include it in Flight Gear. However, is it compatible to the GPL License (the open license which FlightGear is released under)? Also, there was a past poll debating against the integration of projects like Celestia into FlightGear. Any way to address that? You did not read attentively what I had wrote. Both projects what I had mentioned is GPL. kyokoyama wrote in Fri May 13, 2011 9:41 pm: Also, there was a past poll debating against the integration of projects like Celestia into FlightGear. Any way to address that? Do not know about that poll. I mean, to me reasons what could lead people to reject evolving is strange and unreasonable really. There is no need of deep investigations of it. I suppose most of ones who did vote simply could not implement it in any way. Only people who can do gotta decide what to do, because only they would do that. I am pretty sure what if such including will not affect normal user much, nor in means of fps nor in means of disk using nor in any other way, it will be included because it's growing. As, for example, Zan's sky shader what really usable only on high altitudes and what's included already. No matter what someone thinks about it. So I am interesting not in votes but in people who could help me to implement that. I am interested not in "we gotta do that/no, we don't" but in "You may take that and add it here while I will add this there". Note what current engine gives 1 fps while takeoff was on >10fps. I suppose it loads some parts of previous flight path or something. Maybe it does same for any long duration flight, who knows. BTW, as I heard, in current MSFS spaceflight is possible at least on low Earth orbit while in X-Plane it possible even to the Moon. vitos wrote in Fri May 13, 2011 10:58 pm: You did not read attentively what I had wrote. Both projects what I had mentioned is GPL. vitos wrote in Fri May 13, 2011 10:58 pm: BTW, as I heard, in current MSFS spaceflight is possible at least on low Earth orbit while in X-Plane it possible even to the Moon. That's pretty impressive... -and FG can't even top much after 100k feet. EDIT at 19:55PM EDT: I meant FG ON MY SYSTEM can't top much after 100k feet. Last edited by kyokoyama on Sat May 14, 2011 11:55 pm, edited 1 time in total. kyokoyama wrote in Sat May 14, 2011 2:47 am: Oh.... whoops, my apologies. kyokoyama wrote in Sat May 14, 2011 2:47 am: That's pretty impressive... -and FG can't even top much after 100k feet. I suppose You are use Windows version firstly and, again, did not read first post of that topic attentively. If You read "On normal 25km visibility it not shows anything but blue fog, because normal altitude for orbital flight is >100km" and You see blue fog on screenshot, it means what it had been taken on altitude higher then 100km, >300k feet. By second picture You could estimate flight altitude visually. It seems You did not read "Vostok" project topics. 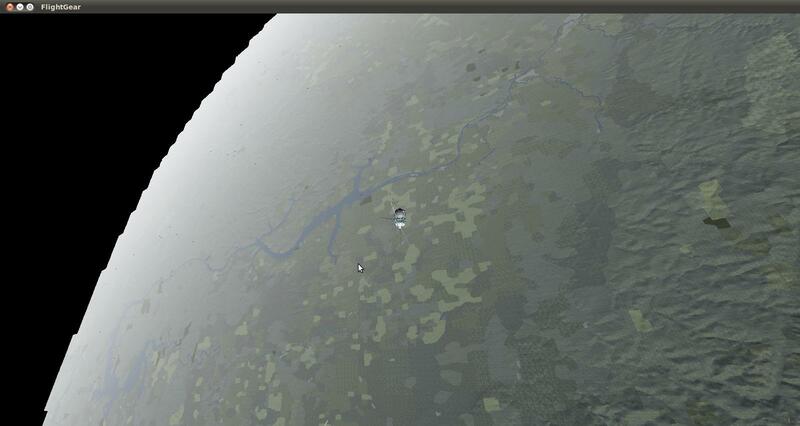 It already possible to make spaceflight in FG on altitudes 100...150km. I had made orbital flights number of times, some other guys had tested "Vostok" and made suborbital flights, for example form South America to Africa. Actually current git version, or current Windows build of it http://flightgear.simpits.org:8080/job/Win32-installer/ws/fgfs_win32_nightly_2.2.0.exe , allows up to ~450k feets and both screenshots had been taken on ~410k feet altitude. But You can not see Earth on that altitude or can not fly far because of huge lags. To be honest, I think what 450kf altitude limit, same as 100k limit previously, defined only by some constant somewhere. Because there is no principal difference if You can not see something. To make it faster than current FG fps and more good looking than current blue fog view that's what that about. kyokoyama wrote in Sat May 14, 2011 2:47 am: Also, nice screenshot! Last edited by vitos on Sat May 14, 2011 7:30 am, edited 1 time in total. It's my impression that there are so many terrestrial issues to be fixed/addressed that you probably won't get too much attention devoted to orbital flights in Flightgear. Orbital flights opens a whole new can of worms besides the need for different rendering - completely different physics, completely different numerical stability issues,... basically you want to write a new orbital simulator, because the amount of stuff you can really use from a flight simulator is pretty small. Thorsten wrote in Sat May 14, 2011 7:17 am: It's my impression that there are so many terrestrial issues to be fixed/addressed that you probably won't get too much attention devoted to orbital flights in Flightgear. It depends only of personal interest. You personally not interested in it because You are find task for You already. Someone else may have interest in other things. Again, You are talks about things what interesting for You personally. Simply try to look on it from point of view of other person. For example, You do not need AI traffic at all if You are interested in military stuff. You do not need much weather if You want "simply flight". You do not need autopilot if planes what You are use not using it really. So there is no common matters. There is never real common matters, only matters common for some people. You are talking of what interesting for You now. I write it for other person, who may be interesting in spaceflight. Thorsten wrote in Sat May 14, 2011 7:17 am: Orbital flights opens a whole new can of worms besides the need for different rendering - completely different physics, completely different numerical stability issues,... basically you want to write a new orbital simulator, because the amount of stuff you can really use from a flight simulator is pretty small. There is no real difference, nor in physics, nor in stability. Only different accounting of gravity. There is no real difference. JSBSim, what Flight Gear is using already, accounts all needed things at least for low Earth orbit flight. You seems to not had read what I did wrote too. If I write "spaceflight is possible already...I did it number of times" it means what I did it from takeoff to land exactly as it was in reality. I do not want to write other simulator because there is not so many people who interested in spaceflight much enough. Everything what used rarely is first candidate to be broken or forgotten. Let's count it simply... It's easy because we already have http://avsim.net/ with topics of most flight simulators, including open source flight simulator Flight Gear, Windows oriented space flight simulator Orbiter, and Windows oriented flight simulator MSFSX. Number of topics in Flight Gear forum: ~30pages with 20 topics on page. So, some open source space flight simulator what I would made could have ~(fg/msfx)*orbiter=0.05pages. With 20 topics on page it means... 1 topic. What that topic could be? "New free spaceflight simulator is created", heh. What would it mean to be exact? No evolving and fast oblivion, because to time when someone else would get interest there will be other, more proper, solutions. Is it reasonable to put years of hard work in it? Not, exactly. Not. Otherwise someone else already would start it. Of course I would want to make freeware open source space flight simulator for everybody. But I am smart enough to avoid suicidal attempts. To continuously improve already existed open source simulator is more vital and realistic way. Like Vitos, I think that adding a new field of experience in FG is a very good idea and may attract some (lots) new skilled developers. So, spaceflight in FG, instead of being simply ignored by the existing community due to the actual workload, may trigger a wave of newcomers and augment the value of the project. Having 2 scenery systems isn't much of a problem if people work together and manage to keep synergy strong and alive. "May the Force be with you"
xiii wrote in Sat May 14, 2011 11:10 am: Like Vitos, I think that adding a new field of experience in FG is a very good idea and may attract some (lots) new skilled developers. So, spaceflight in FG, instead of being simply ignored by the existing community due to the actual workload, may trigger a wave of newcomers and augment the value of the project. Having 2 scenery systems isn't much of a problem if people work together and manage to keep synergy strong and alive. Thanks. Do not know about a lot. As You may see from forums comparison, only 10% of current Earth population do something for others really, while 90% works for own sake. Those who works for own sake would not add something to open source. They would produce for payware in plans of making own payware. They would use payware in plans of making own payware. They would steal payware in case they not have money for it, but they would not use open source no way, because it's not a direct way to own sake and 90% of people can not understand what You can have own sake only because of common good. I am realist. I am hoping for new great wave of developers but not believe in that wave much, because of such proportion. But any guy or girl who can really add something to common good instead of making predetermined failed attempt to make something great alone matters for me. Because only with them something can be changed. Others is strong on right or wrong path. So if that topic could not help I would add that proposal and ask of helping hand in next newsletter and others, not Flight Gear specific, forums. Maybe it will help. I beg to differ. You did not launch and land as it was in reality, you did launch and land as a Flightsimulator would allow you to do it and just didn't notice the difference to reality. There are lots of physics issues which are not in Flightgear, but needed for spaceflight. I fail to see how Flightgear could possibly get re-entry physics right for starters. Re-entry creates super-hot plasma shockwaves, and here actually chemistry matters, because there's a lot of reactions going on which alter atmospheric properties. Doesn't occur for flight simulations. Re-entry has been and still is a tough problem to simulate. But orbital flight requires not only to simulate gravity vs. centrifugal force - there's drag from upper atmosphere, magnetic fields and these sort of thing. Numerically, orbital simulations need to be long-term stable because there's no dissipative force to dampen perturbations away. Orbits continue over days - your calculation of the orbit should not accumulate mistakes over such times. Not so for atmpspheric flights, where any perturbation is quickly damped away by drag on the timescale of seconds to minutes. Again, You are talks about things what interesting for You personally. Nope - I'm trying to explain to you why there has not been any response on the devel list. However, if you think you know already, then I'll just quit taking here. Peace love and Starwars ? When it comes to hot weather you both better go water the flowers in the garden, (or at least focus on a funny MDW nasal simulation) until conditions for a fun and friendly collaboration are back.